What does THIS leak mean for Captain Marvel? In a recent interview with Entertainment Tonight, Samuel L Jackson let slip some details and the Internet is reacting accordingly. The actor, who has played Nick Fury nine times in the Marvel series, sat down to discuss the upcoming Captain Marvel solo movie, in which he features prominently. When they got to discussing Captain Marvel, aka Carol Danvers, Jackson said: “She’s pretty much the strongest character – in terms of someone with powers are able to do things – in the Marvel universe. “So, for Carol Danvers to be that person and for Brie to become that person, it’s gonna be a dynamite thing. Whether Jackson knew he was confirming a long-standing theory about time travel or not, the Flerken is out of the bag now. Months ago, fans parsing the set photos for Avengers: Endgame spotted a clue to the time travel plot. These photos showed Captain America, Ant-Man, and Iron Man with circular like devices on their hands. Eagle-eyed Marvel fans spotted that they look strikingly similar to Thanos’ time travelling devices. The Avengers costume suits are covered in motion capture dots, which means that visual effects will likely be used in addition for those scenes. Even keener-eyed Avengers lovers noticed the costumes were anachronistic. One fan tweeted: “Based on set pictures, the current fan-theory is that Tony Stark will use time travel to try and stop Thanos in Avengers 4. 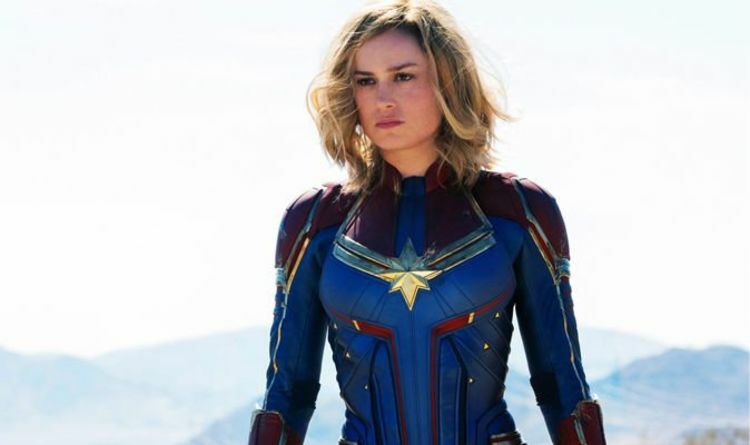 How prominently Captain Marvel will feature in Avengers: Endgame remains to be seen. But her time travelling abilities are likely to be integral to the resurrection of the fallen Avengers. Captain Marvel is out in cinemas on March 8, 2019.